pCloud is great and you know that because you have been using it for a while. Now it’s time to tell your friends – and get paid for this! 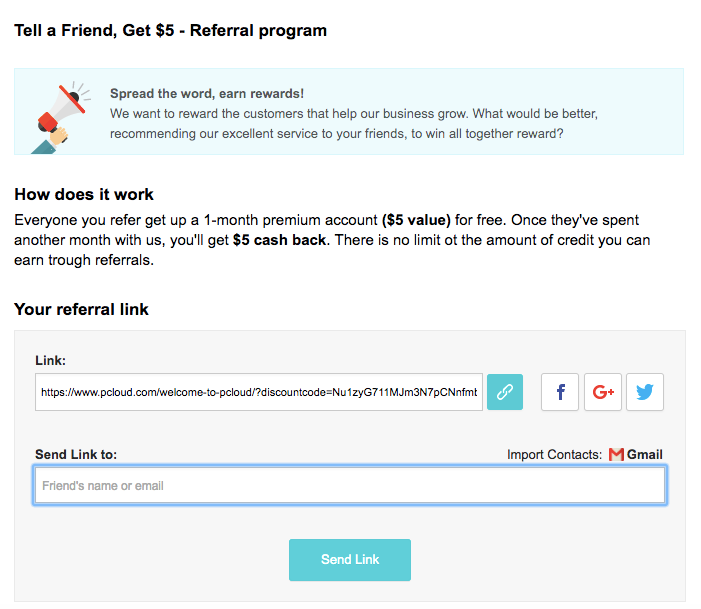 Introducing: the pCloud referral program. It’s very, very simple. You may have noticed that this week a new tab appeared in the menu of your pCloud for web: “Tell a Friend, Get $5”. When you click on it, you are taken to your referral page, where a special referral link is generated for you. You can then just click on the green “Copy” icon and then send the link via email or an instant messenger for example, or you can use of the social media buttons to the right to share your link on your Facebook, Google+ or Twitter profiles. If you prefer to share the link via email, you can just type in the emails addresses of your friends in the field under your referral link, and click on “Send Link”. We will then generate an automatic email for you and it will be sent to the people you chose. Even easier, you can import your Gmail contacts and have the email addresses from your Gmail contacts list prefilled (just type a letter or two for the emails to appear). Once you invite your friends, they will get a pCloud Premium plan for FREE for 30 days. We’re not kidding – that’s an entire month of our paid 500 GB cloud storage subscription absolutely free of charge! When your friends’ free 30-day trial ends and they use our Premium subscription for another month, you’ll get $5. Explained simply, your friend gets a month of Premium for free, and then you get a month of Premium for free. Of course, you don’t have to spend your $5 on pCloud services – you can just withdraw the money and spend it on whatever you want. As we said, you get $5 for every successful referral you make – but there is no limit on the number of friends you can refer so there is no limit on the money you can earn with the program! As soon as you have $10 in your account, you can withdraw the money to your PayPal account. We have set this payout limit super low because we want to make sure you get paid, no matter what. If you want to see how many of your friends have signed up from your referral links, or maybe even give someone a little nudge to do so, you can just click on the link that says “Check your referral statistics”. Since the referral is a part of our affiliate program, you’ll be asked to sign up as an affiliate. Don’t be alarmed! It will only take one button click, and you will have no obligations as an affiliate whatsoever. Just click on the blue button that says “Become Affiliate”. Then click on the “Referral” tab in the menu on the left, and you’ll be able to see detailed statistics on how your referrals are doing. This is also where you can set your PayPal account, or check how much money you have made by inviting friends to pCloud. Both programs have the same goal: to let you earn money by inviting people to pCloud. The affiliate program, however, is intended for people who want to spend a little bit more time working on that, and maybe even make a living as our affiliates. This is why it’s a little bit more complex than the referral program. We designed our referral program so it’s as easy to use as possible – and so that you can make some cash by spreading the word about the best cloud storage solution on the market. Frankly, we don’t even know why are you still on our blog, instead of inviting your friends already. Go share the news and earn some money!